Graceful Smith Tower rises above the “sinking ship” parking garage that prompted the city’s preservation movement. From aboard the ferry crossing Puget Sound from Bainbridge Island to Seattle, I inhaled the fresh air, cleansed by another day of rain that always seemed to dissipate in the evening. The skyline of Washington State’s largest city was on full display in a blaze of fiery reflections as the orange rays of the setting sun bounced off countless windows of the downtown’s skyscrapers. To the left, the Seattle Space Needle stood proudly in its iconic weirdness, its roof recently repainted back to the original neon tangerine. But it was the building all the way to the right, at the southern tip of the skyline, that really caught my attention. Old, attractive, dwarfed by its newer neighbors, and a little separated from them, the Smith Tower looked like the runt of a large litter, left behind and ignored by its bulkier, more aggressive siblings. And it was the one building I really wanted to check out. The next day, I headed downhill from my lodgings at the fantastic Hotel Sorrento to Pioneer Square, Seattle’s birthplace, where the Smith Tower rises across the street from the “sinking ship” parking garage, a widely loathed monstrosity erected after the 1961 demolition of the old Hotel Seattle — and the structure that spurred the architectural preservation movement in Seattle. Bearing a striking resemblance to New York’s Metropolitan Life Insurance Building, the Smith Tower opened on July 4, 1914, as Seattle’s first skyscraper (at 38 stories, although it falsely claimed 42) and the tallest building west of Ohio. 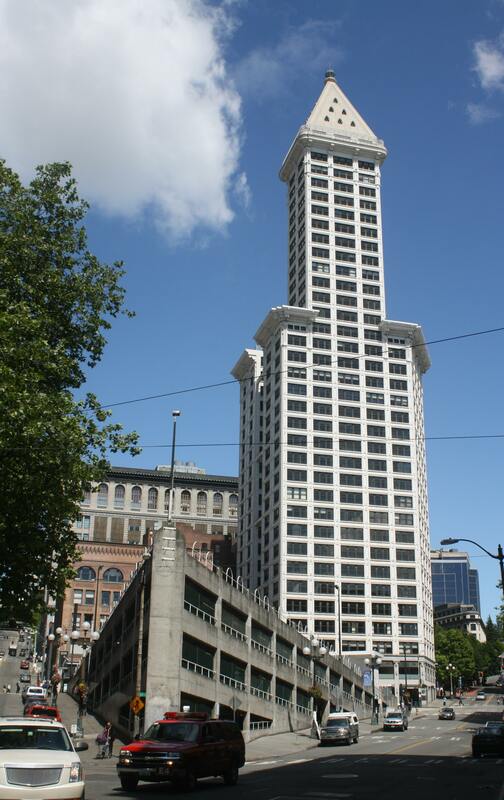 It remained the tallest building west of Chicago for 50 years and the tallest in Seattle until 1969. The brainchild of tycoon Lyman Cornelius Smith, who made his fortune in such diverse industries as livestock, firearms, and typewriters, the original plan called for an 18-story structure, but his son, who completed the construction after Smith died in 1910, convinced him to double the height so that the building could rival the skyscrapers puncturing the sky in New York and garnering their owners, such as Woolworth and Singer, abundant media attention. 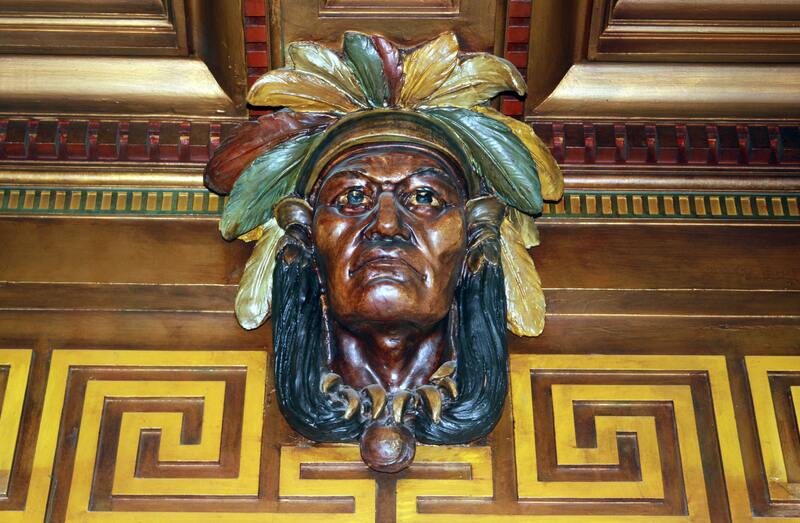 Details in the lobby include rows of the handsomely carved representation of Chief Seattle. With memories of the Great Seattle Fire of 1889 still fresh in the city’s collective memory, the Smith Tower utilized very little wood. The building’s frame used nearly eight million pounds of steel; window frames and sashes were fashioned of bronze; and steel doors were hand-finished to resemble highly grained mahogany. The entire building, except for the first two floors, which were covered in granite, was clad with white ornamented terra-cotta, a material so resistant to pollution and grime that the tower received its first scrubbing only in 1976. When I entered the lobby, I was transported back to a time when architecture mattered and structures (even office buildings) were built to be beautiful, a millennia-old tradition that unfortunately ended long before I started my own career, in a generic, boring, insipid cereal box in Manhattan. The Alaska marble floor, mosaic tiles, and Mexican onyx positively glistened. A Greek key belt trimmed the top of the lobby walls; every few feet, carved Indian heads (presumably of Chief Seattle, a Duwamish chief who encouraged ecological responsibility and respect for Native Americans’ land rights while still accommodating white settlers, and from whom the city derived its name) ran above the banks of beautiful and unique elevators. Surfaced in brass, just like the old telegraph and mail chutes, the elevators were the only ones I’ve ever seen that have an open-lattice door. Through this door, I could see into the hallway of each floor as I ascended, catching quick glimpses of the tile numbering on the floor of each story, as well as through the glass walls in front of each office and into the work space. To make the elevators even more rare, uniformed operators work the cages, taking riders to their desired floor, a genteel touch of class that I had experienced only a couple of times in my life, decades ago. 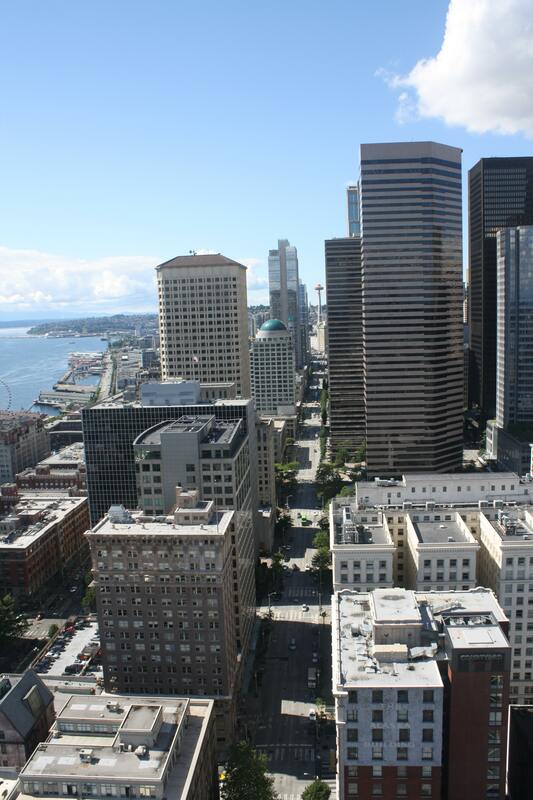 From the 35th floor, you can take in views of the entire city, with manmade canyons leading to the iconic Seattle Space Needle. The first thing I planned to do was to walk around the outdoor observation deck on the 35th floor and admire the 360-degree views from the platform that wends its way around the entire building. But I was sidetracked inside by the rich décor of the ornate Chinese Room on the same floor. This former banquet hall, which can still be rented out for weddings, parties, and presentations, boasts a fantastic carved teakwood ceiling with insets of 776 semi-precious porcelain discs. Gifts from Empress Dowager Cixi, the last empress of China, throughout the room include carved Blackwood furniture and the Wishing Chair. The chair incorporates a carved phoenix and dragon, which, when combined, foretells marriage. Any unmarried woman who wishes to change her status can sit in the chair and, as legend holds, will be married within a year. When I finally stepped onto the observation deck, I was more than a little impressed by the city and its setting. The stupendous views from all four sides of the building encompass large chunks of the city, including the Space Needle at the end of a skyscraper canyon, Elliott Bay and the sound, the sports stadiums, the rail station, and the Cascade Mountains one way and the Olympic Mountains another. Back on street level, I looked up to admire this building once more. The tower is crowned by a three-story pyramid topped with a glass dome that is illuminated by blue light every night, except in December, when it switches to a holiday green. Inside that pyramid lives one family — the building’s only residents — currently in the middle of a 20-year lease. With an unimaginable level of privacy and incomparable views refreshed by continuous shifts in light and shadow throughout the course of the day, these people were quite literally living the high life. Thank you so much for this wonderful write-up, We do love this wonderful Seattle building! Great post and wonderful building! My brother and his family live in Seattle, but since I’m from CT I’m not able to get out there much. It’s a great city. Thanks! Seattle is definitely a great city. Your brother is very lucky! He is! Just wish he wasn’t so far away, selfishly! Great post! I’ve always though the Smith Tower is one of Seattle’s most handsome buildings.